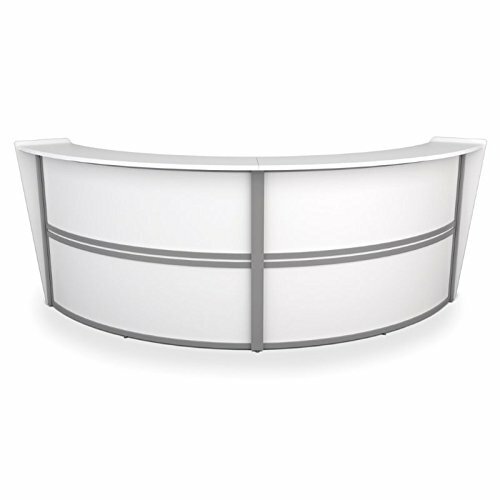 Make a great first impression on clients and guests while saving your budget with OFM's Marque Series Reception Station. The durable construction features a powder-coated painted steel frame and a thermo-fused melamine finished with self edge. But it's not all about looks! The convenient design keeps the user in mind. There are wire management cutouts in the interior desk to eliminate cord clutter. Your maintenance crew will also be happy because no tools are required for assembly. This model meets or exceeds industry standards for safety and durability, and is backed by OFM's Limited Lifetime Warranty. Features: Finish: Thermofused melamine finish, Silver Frame; Material: Laminate, metal; No tools required for assembly; Silver frame and thermo fused melamine finish with self edge; Leveling guides included; 19.75" deep interior desk; Convenient wire management cutouts on interior desk surface. Specifications: Overall Product Dimensions: 45.50" H x 124.25" W x 49" D ; Product Weight: 256 lbs. Contemporary Reception L-Desk - 71"W American Dark Cherry Dimensions: 71"W x 72"D x 42"H Weight: 416 lbs. Neoterik Collection Reception Desk- 48"W Mocha Laminate/Plexi Side Panels Dimensions: 48"W x 21.5"D x 43.25"H Weight: 176 lbs.